Add low-maintenance beauty to your home landscape with Aurora Hardscaping. What if you could improve the scenery with features that don’t demand special attention? Here are four great Aurora Hardscaping ideas for homeowners who like to relax on the weekend. Whether they’re built with concrete block or native field stone, well-placed retaining walls minimize erosion from pouring rains and help control storm flooding. They shade delicate gardens from Aurora summers and provide welcome wind breaks when winter storms blow through. Retaining walls are also a beautiful way to offer distinctive edges to your landscaping. Towering shade trees thin the lawn under their branches, and family foot traffic wears ruts along favorite home trails. Win this turf war by giving up on repeated re-seeding. Inviting pathways of natural stone or concrete pavers eliminate the need to constantly coax grass into growing over bald spots. Walkways weave lovely accents through your landscape, and they permanently stamp out muddy spots. A wonderful Aurora Hardscaping option! 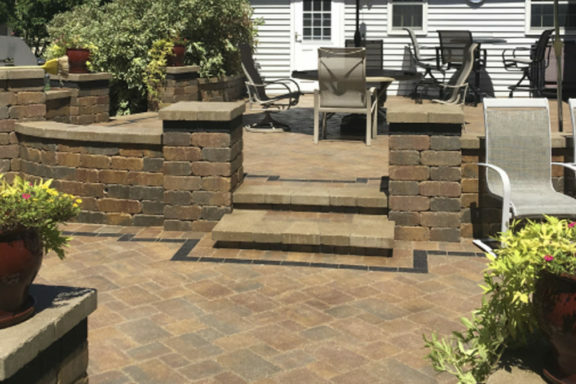 Patios are an integral part of your Aurora Hardscaping. 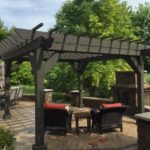 Patios provide a gathering place for home owners and their guests. A comfortable place to sit with beautiful furniture and perhaps a table is always a plus in any yard. A patio also helps break up your landscape and give it depth. You’ll never give up the barbecue grill, but that cast iron buddy can’t hold a candle to the hardscaped good looks of rugged fire pits. Most options for remodeling patios and pools are limited to laying down new surfaces, but these open hearths create exciting new centers for outdoor home entertaining. If you’d like more ideas, just call us at BLC Yardworks. We believe you deserve a little more free time on the weekends.